Carolina Panthers player Mike Tolbert apparently got so pissed at his mechanic that he had the cops called on him by the shop, and passive-aggressively retaliated by paying his $3,900 bill in coins. Tolbert took to Instagram to warn his followers not to do business with Motion Lab Tuning, an automotive tuning company in Charlotte, NC. Motion Lab reacted with a post on Facebook claiming to have called police on Tolbert after he argued with them over services, with the football player eventually paying the $3,900 bill—just not by cash, card or check. Tolbert’s Instagram post, embedded below, claims that Motion Lab Tuning was two months past schedule on a job the Panthers player went to them for, and then asked for more money because Tolbert was a “millionaire” football player. Motion Lab Tuning then took to Facebook to publicly respond, claiming that Tolbert had brought an old car to the shop for an engine swap. The post claims Tolbert originally expected them to do the work “for free” because he’s a famous NFL player. Today was a huge waste of time and a major disappointment. Many of you may know who Mike Tolbert is. He plays for the Carolina Panthers. He had an old car at the shop for a motor swap. You might think because he is a professional athlete he would be a fair and ethical person. From the beginning, he attempted to get us to do work for free because he is ‘Mike Tolbert’. So today, I am disappointed that it came to this, I had to call the police on Mike Tolbert. He and his buddy threatened me. CMPD actually banned him from the property today. They forced him to pay his bill before leaving though. In a passive aggressive manner, he thought he would get the last laugh by paying in coins. Pretty dumb really. All $3,900 in coins were easily identifiable as they came from a bank in boxes and perfectly counted out. I will say this, those coins will be taken in the boxes they came in and will be taken to a teller at BOA for deposit. Now he is slandering me, saying things that weren’t true. Name calling, etc. Jesus man just pay your bills and be a good person. I also have to break it to my son who is a fan of Mike Tolbert that he is a real scumbag that doesn’t want to pay his bills. 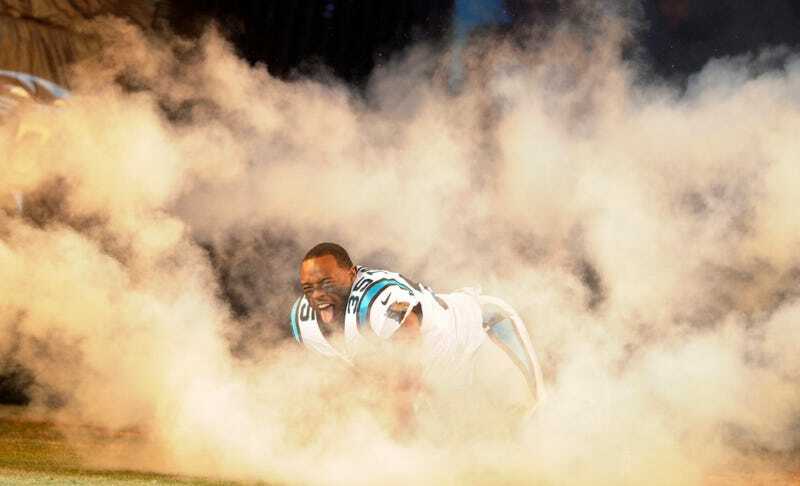 There’s a special place for guys like Mike Tolbert. People like him that try to cheat a small business. Shame on him for this type of behavior. An anonymous tipster tells Jalopnik the shop was doing an LS engine swap into a mid-1970's Caprice. The Motion Lab Facebook post is written in the first person, but it’s unclear who wrote it. The shop is owned by Todd Marcellini. Jalopnik reached out to a Panthers spokesperson, who spoke with Mike Tolbert about the incident and directed me to the Instagram post for details of the dispute. An email to the owner of the shop has been sent out, and the Charlotte Mecklenberg Police Department did not immediately return our phone call. We will update with more information as we have it. Update: A public information officer with the CMPD reached out to Jalopnik to confirm that police had been called to Motion Lab Tuning, but no police report had been filed due to it being a civil matter.